Design: Lapel collar, half bell sleeve, soft and stretchy, good quality fabric, suit for casual wear. Matching: It's comfy and stylish and easy to pair with any blouse even a casual tank. Perfect blazer to wear over your favorite suit pants, leggings and skinny jeans. Features: Women work office jacket, bell sleeve make this women coat more unique and would make you much more elegant and casual, the clothes pattern helps to shape your body perfectly. 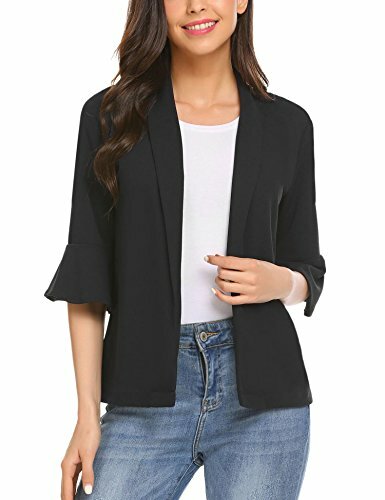 Occasions: The well-made lightweight and comfortable women blazer is suitable for many occasions, such as office, daily wear, home, gathering, party. If you have any questions about this product by Gfones, contact us by completing and submitting the form below. If you are looking for a specif part number, please include it with your message.